Great News! 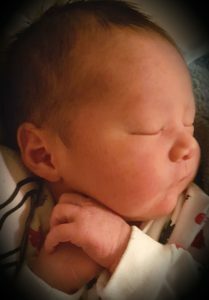 Kris and I welcomed our second son, Charlie Kingfisher Anderson, on 30 August, after less than 2 hours in hospital. See pic of Charlie sleeping – aww! As mentioned in Part 1, I initially thought Charlie was a girl. I love the name Ariel, and kept seeing The Little Mermaid pop up throughout early pregnancy. However, after the scan, Kris suggested the boy’s name Harley – and then we started hearing motorbikes all the time. We eventually decided on Charlie, as we love Charlie Chaplin (see my numerology reading on his 37/10/1 lifepath) and Charlie & The Chocolate Factory. Plus it’s gender-neutral, an anagram of Ariel and close to Harley. While in utero, Forrest confirmed his name the day we chose it. As soon as we turned on the TV, the opening of Forrest Gump began playing, then we met people called Forrest. He also telepathed that his middle name was Galahad when he was three weeks old – this gave him an 18/9 Destiny, which matches his 18/9 Old Soul lifepath – read more. Find your lifepath. With Charlie, it was even easier. 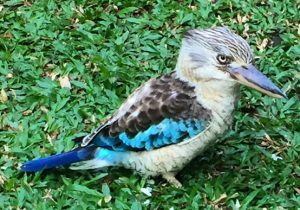 My super-intuitive sister-in-law, Jodie (a fellow 29/11 lifepath) came over with a photo of a blue-winged Kookaburra (a type of Kingfisher) she saw on holiday. As soon as I saw it, I thought, that’s Charlie’s totem animal! Throughout the pregnancy, myself and others (crystal healer Deniz Akan, psychic Vicki Haspels, and Kris his Dad, who does Reiki), saw Charlie as a turquoise blue/ bright green being, who was very calm and Zen. 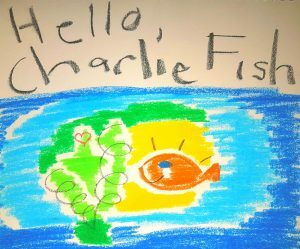 Here’s the drawing I made for Charlie once I discovered my pregnancy. I called him Charlie Fish because I felt he liked water, plus he kicked like a mermaid (his feet would stick out of my stomach like a tail). 38 +61+36 = 135, or 9 Destiny Name (Old Soul/ Healer) – the sum of letters in your birth name. -This name plugs every gap in Charlie’s numerology, which makes me happy, and will potentially reduce his frustration this lifetime. Note: As a professional numerologist, I recommend choosing a baby’s name after birth so it can be matched to their lifepath – see Choosing the Right Baby Name. ave birth to Charlie next to the water-tub, rather than in it as expected. -Even spookier, in Arthurian Legend, the Fisher King is a wounded monarch who holds the Holy Grail (the vessel that Jesus drank from at the Last Supper). He must be carried everywhere (Charlie has always shown me that he loves being carried), and sits by the river, fishing all day (my sister-in-law Jodie had just returned from a fishing trip when she visited – plus I’d named Charlie ‘Fish’). AND when I said I was going to name him Charlie Kingfisher, she was…cleaning her fishtank. Wow. Now for this – according to legend, the Fisher King can only be healed by one person, his grandson Sir Galahad (!!!) I got so emotional when I read this, as Forrest’s middle name is Galahad – this was the confirmation I had been looking for. I knew that Charlie and Forrest have been together before – when Forrest met baby, he laughed, brought him all his toys then did a happy dance. 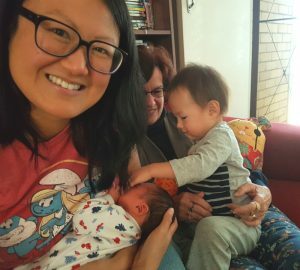 Here’s a photo of their first ‘reunion’, Forrest is with his Aunty Kathy. Charlie also smiles when he hears Forrest playing, even though he’s less than a week old. I’m sure they’ll tell us more, once they start talking. Don’t believe me? See Children’s Past Lives by Carol Bowman, or my past life regression posts). Yesterday, Kris and I brought Forrest and Charlie together for the first time on our balcony. 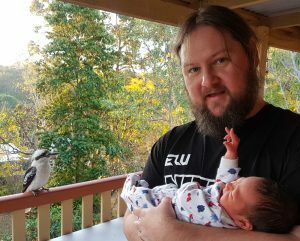 A Kookaburra swooped in to talk to Charlie – see photo of him waving back. This was the first time we’d seen one in ages – I’ve only seen one or two since my friend’s passing – see this post Kookaburra Proves There’s Life After Death – My Friend’s Last Laugh Speaking of 3’s and Charlie (see Part 1), Butterfly was a Master 33 lifepath, and appeared to me in a dream recently, telling me she’ll help me become a psychic medium. Psychic ability and trust in nature is not only your original state, it’s your path back to peace. I hope this post has encouraged you to open up to Spirit signs and messengers, whatever their form. There is nothing to fear from connecting to higher realms, their assistance is unconditionally loving and energising. Breathe in the gift of life now, and exhale any worry. You are safe, and the next step is always illuminated. P.S Haha, just checked my email and I received an unsolicited message today from Kookaburra Camping Gear (!) Spirit loves a joke…and as I finished this post at 2am, a flock of Kookaburras started laughing, Can’t escape the love that unites us. 11:11 We are One Energy. Happy 1st Birthday Forrest! Here Comes Your Sibling!